Touring the Guinness Storehouse was a highlight today.It marks the end of a pilgrimage for this beer lover. Ireland's unofficial national intoxicant, STOUT, is more a celebration of its culture for me than a beverage, but of course, I included a few pints as a liquid sovenier. The tour featured a tasting and also instructions on how to pour the perfect pint. Afterwards, we went up to the top level @ The Gravity Bar, to stoutly proclaim our allegiance to the Emerald Isle's mead. We had a pint poured by the pros, and waited in excruciating 122 seconds to top it off, for the right head. 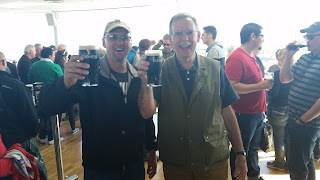 Guinness tastes better in Ireland. 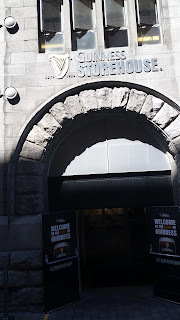 There's a feeling of authenticity of drinking a beer and its true home, and the ambience and history of the brew added to the appearance and flavor, and knowing that the pumps have been flowing all day, helped too.